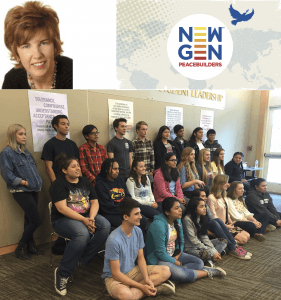 Rotary Peace Fellow Patricia Shafer, Co-founder of the NewGen Peacebuilders program, a youth peace education program designed for high school and university students ages 14 to 25, will be our speaker on September 14th. She will be joined by facilitators Doug Johnson, Diane Moresi and 2016-17 chair Casey D’Angelo. One of the key elements/outcomes of this youth peace education program is a team peace education project that youth complete. Some of the students from our charter class last year will share their project with us and the impact this program has had on them personally. Patricia will conduct an orientation seminar on NewGen Peacebuilders preceding the meeting from 9 to 11:30 am at the Flamingo. 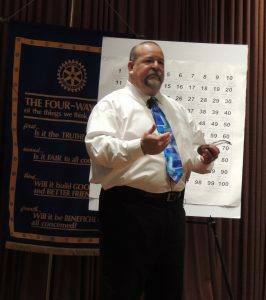 It is open to Rotary Club members and others interested. 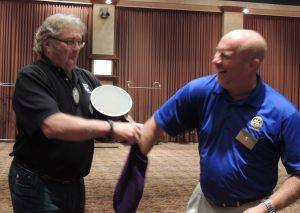 * Many thanks to John Poremba, Rich DeLambert and Dan Schell for room set-up and take down for last week’s meeting. Invocation: Steve Reuters. Shared Michael Jordan quote. Steve Amend from the Sunrise Club joined us today. Past President Mark Burchill’s wife, Mel Konrad, Past President Marnie’s mom, Rose and stepfather Kirk Moeller, Andy Banes, from the Active 20/30 Club, US Army Serviceman Carlos Ortiz and Derick Orr from The Salvation Army. Welcome back sunshine superman Rick Allen! Glad you are back and doing well! Please don’t make the news again any time soon unless it’s for winning the lottery! Shari Shamsavari’s back went out and apparently didn’t come back (I know, that was bad) GWS, Shari – we miss you! $117 Yankee dollars. Ray Giampaoli walked away with the $10 consolation prize like the little Monopoly guy who wins 2nd place in a beauty contest. El Presidente Jose noted that the board voted to explore associate membership as a way to make Rotary more accessible to more people. The annual meat auction and barbecue social will be held on October 6th at Diane Moresi’s house. 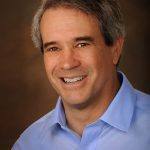 Doug Johnson announced that next week Patricia Shafer will be back for the New Gen training before the regular meeting, starting at 9:00 a.m. October 1st will be the Gran Fondo. We need 20 volunteers to work the Monte Rio rest stop at 6:30 AM. Ray Giampaoli. – announced Sonoma County Mayor’s Committee on the Employment of People with Disabilities, Best Practices Breakfast to be held on October 19th from 7:30-9:30 at the Flamingo. Andrea Geary announced the Sept. 30th Inter Club barbecue/pot luck social at The Living Room sponsored by the East Club. RSVP to Andrea and $10 + a side dish in advance please. 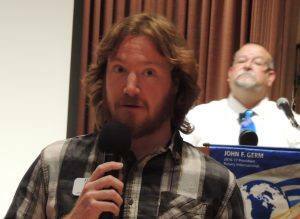 Kris Anderson reminded us that there is a Family social at Julia’s house on Sunday, the 11th from 1-4 p.m. and that there is a Rotary Means Business meeting at Franchetti’s on September 15th from 5:30-7:30 p.m.
Andy Banes told us about the new fundraiser the 20/30 Club is doing and invited us to come. It’s a beer event, so many ears immediately perked up. The 20/30 club fundraiser on Sept. 17th is an October fest that will be held at the SR Vets building starting at 1pm. The fundraiser will help support their kids Christmas Program. 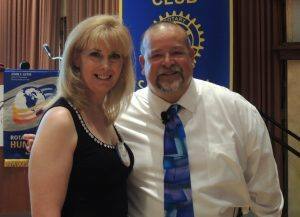 Carolyn Fassi – did an interesting Rotarian Magazine article report. El Presidente awarded her a blue badge, stole her red badge and then taxed her $10. What a country! For the 2016 SCMC Event Flyer, Click here. For the 2015 Final Booklet, Click here. 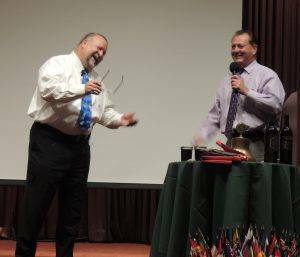 Doug Johnson joined Vanna White, er…..El Presidente onstage to award those who bought squares with prizes. For the $1,000 Paul Harris, Diane Moresi is the lucky winner! 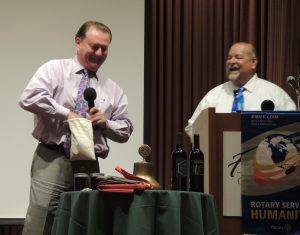 Tony Roerick has a new grandchild Maya Rae for which a Yankee dollar was collected from each Rotarian for a total of $62.00. Tony matched that amount to start a Paul Harris for her. Jackie McMillan was spotted at the Sebastopol Cajun Festival and fined $50. She couldn’t make up her mind where to allocate it. Robby Fouts is back from Burning Man. $200 to local foundation ($100 to foundation, $50 Levar and $50 Brown). 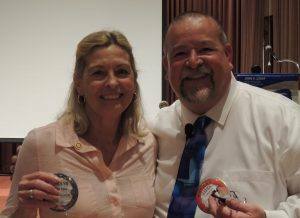 Andrea Geary was recognized for having a directory photo with Ray Giampaoli’s name next to it and…….. for being the newest Rotarian of the Month! Today we were honored to have Gil Sanborn, a Civilian Aide to the Secretary of the Army (CASA) in California speak about the military from several angles. 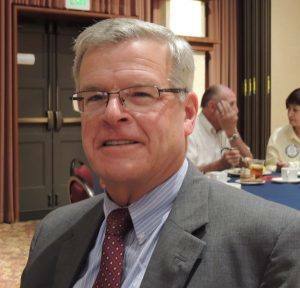 An eye witness to the fateful events of 9/11 in New York City, Mr. Sanborn discussed the changes in military preparation from the end of World War II through today. Events noted were the Peace Agreements at the end of the war and then the immediate military buildup by the Soviet Union that led to the Cold War, the fall of the Berlin Wall and then later the terrorist threat. In addition to changes in military policy and readiness required by each different era, Mr, Sanborn explored the effects of multiple tours of duty in the “All Volunteer Army” personnel and their families. It was the type of informative and enlightening program that our club should be proud of. Great job in program booking from the Program Committee! Here is the link to his CASA Facebook page. 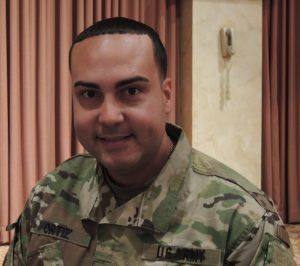 You will receive his postings if you “like” it.